Disney's Frozen captivated imaginations, and now the beloved characters and their stories are available for imaginary adventures. With enchantingly cool figures and playsets (each sold separately), kids can have big fun acting out their favorite moments from Frozen or even imagining entirely new snowy adventures! Make playtime magical with Frozen fun! The beautiful winter garden features translucent trees like giant ice crystals, a fountain and other delightful details. The set also includes a cape for Elsa, a sled for fun in the snow, and 3 Snap-ins pieces. 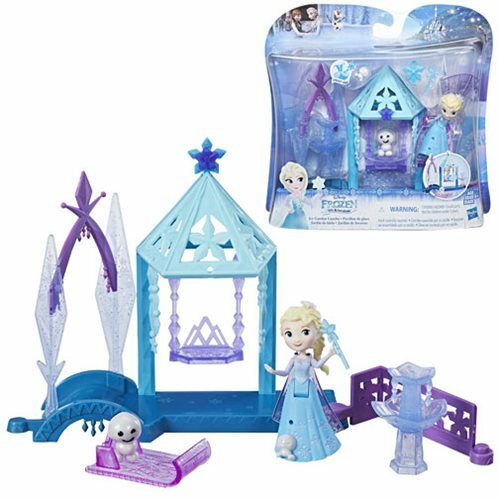 This set and the Spa Retreat (sold separately) both connect to the Royal Chambers playset (sold separately) so kids can build out their Frozen world! Includes doll, cape, Snowgie, sled, playset (2 pieces), 3 Snap-ins pieces, 3 accessories, and instructions. Ages 4 and up.